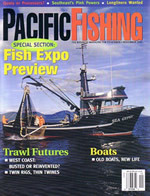 I contribute to many commercial marine and commercial fishing magazines. I am field editor, a position that gives salary-free mast head status, for both Professional Mariner and Pacific Fishing. They are both great magazines because they have content that respects their readers and editors that respect their writers. Professional Mariner magazine, edited by John Gormley, is devoted to licensed professional mariners and to the industry in which they work. If your work takes yo to the bridge of a commercial vessel of any size, or you mangae workboat or ships, or simply enjoy staying in touch with the commercial marine world, this magazine will be of interest to you. I like writing for it as it gives me the opportunity to ride commercial vessels on rivers and seas from the arctic to the tropics. The cover displayed here is one that I took while riding with Bay and Delta tugs in San Francisco. I have recently begun writing for this delightful magazine published in France with my good editor Jenny Bennett living in the UK. The magazine covers all aspects of the maritime world both contemporary and historical. I have found the column section to be a good home for my stories on Hong Kong fishing boats, Indonesian Pinisi and the Bugis seamen who crew them as well little pieces on Thai noodle boats, Cambodia's Tonle Sap Lake boat builders and a World War II American freight boat that has become a classic live aboard and charter boat in Canada. The great thing about writing for this magazine is the free copies that they send me as the magazine is beautifully designed with fascinating articles.